Whether you "hang your stockings by the chimney with care," or somewhere else in your home, festive holders are a cheerful way to display stockings throughout the holiday season. Options abound, from mantelpiece holders to lighted holders to stand-alone holders. Getting that stocking to stay up, especially after Santa Claus stuffs it with goodies, might require a special Christmas stocking holder. Stocking holders add a festive, decorative touch anywhere you put them. They also help prevent damage to your mantelpiece or wall from nails and tacks. The traditional location to hang stockings is a mantelpiece above a fireplace. A stocking holder adds a touch of whimsy without causing damage. Alphabet holders: Spell out a name, or use an initial for each family member with these individual alphabet stocking holders. The holders are made of aluminum and iron with a bronze finish. Any letter of the alphabet is available for about $30 and shipping is free at Pottery Barn. 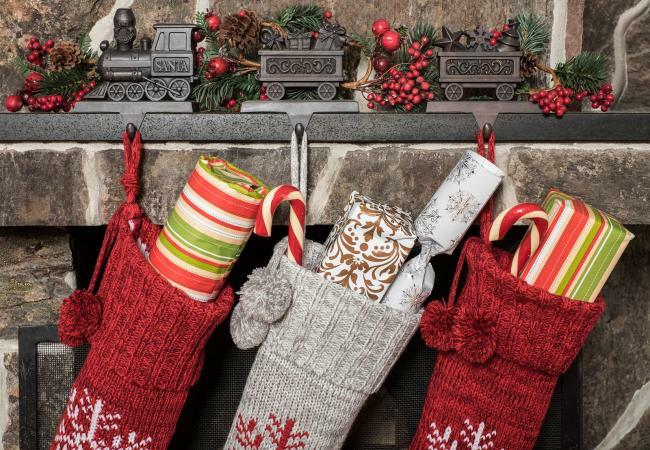 Personalized steel: This steel holder can hold up to six stockings. It may be personalized with your family name or your favorite holiday sentiment up to 10 characters long. It costs about $60 plus shipping from MerryStockings. Gingerbread house: If you enjoy decorating with gingerbread for the holidays, this stocking holder is for you. It features a sweet gingerbread house made of clay dough. And since it only costs about $8 plus shipping from Walmart, it won't break your holiday budget. Wooden stocking hangers: These stocking holders are made of hardwood in Maine. They're angled to hang from a mantelpiece, shelf, or ledge. They are unobtrusive and blend well with many décors. Each set of two is available in natural or green and costs around $25 at L.L. Bean. Shipping is free. Snow globe holder: If you're a snow globe collector or you just enjoy the fun of snow globes, this stocking holder is for you. It's made of glass and resin. It includes a battery-operated motor, no shaking required! Three scenes are available - a polar bear and her cub, a Christmas tree, and Santa Claus. Each is about $60 with free shipping from Balsam Hill. Light-up stocking holders are a fun choice if you enjoy decorating with a little bling. 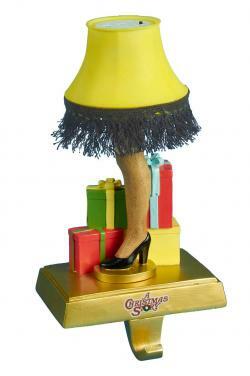 Light-up leg lamp option: Fans of A Christmas Story, you've found your stocking holder! It features the iconic leg lamp from the beloved film. The lamp lights up using three included button cell batteries. The holder costs about $38 and shipping is free through Walmart. LED red gift holder: This shimmery holder is shaped like a present. Its seven white LED lights are battery-operated. Choose green or red for about $25 each, plus shipping at Pier 1 Imports. LED flicker candles holder: This holder has a vintage look. It features three LED flicker candles surrounded by festive sprigs of holly and sitting on a glittered base. The holder requires three AAA batteries, and at Sears, costs about $20 plus shipping. Marquee light-up holders: Light Santa's way to your stocking with a marquee-style stocking holder. It's available in two sentiments: Joy and Noel. Each holder features LED light-up letters which sit on a glittery metal base accented with faux holiday greenery. Three triple A batteries are required. The holders cost about $22 each or $43 for the set of two, plus shipping, when ordered at Touch of Class. Personalized metal stand: You can personalize this stocking stand with your family's name, up to nine characters. It's made of metal and has your choice of a green Christmas tree or yellow star on top. The stand holds up to six stockings and costs about $28 from Walmart, plus shipping. Christmas tree stand: This metal stocking stand features lovely scrollwork and resembles a Christmas tree. It even has a star on top. 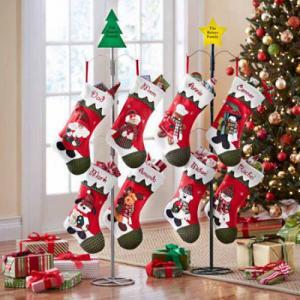 The rotating stand holds up to eight stockings in a vertical fashion. It's available in gold or black and costs around $40, plus shipping at Improvements. Chalkboard presents stand: This stand holds up to six stockings. It features chalkboard panels in the shape of presents that may be personalized and changed each year. It costs about $30, plus shipping at Kirkland's. There's a Christmas stocking holder that fits for every design style, whether it's country, contemporary, whimsical, or vintage. 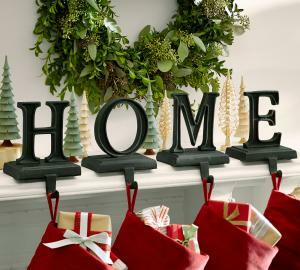 Stocking holders add charm to your Christmas decor.